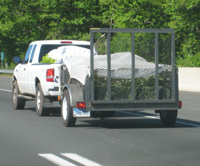 Camp Trailer plates are issued for use on privately-owned trailers. While they are certainly used on camping trailers, they are also used on pretty much any light-duty non-commercial trailer – including boat trailers. This type started in 1924, with plates similar to regular commercial plates except for a ‘B-‘ prefix. This continued until 1932 when “Camp Tr.” was spelled out for the first time, and the ‘B-‘ was dropped. There were various design iterations throughout the years. The numbering format has remained all-numeric since the ‘B-‘ prefix was dropped. Camp Trailer plates are also available as vanities, as well as a number of the special-interest types. These use a stacked ‘CPTR’ in the serial to designate the type. Click the picture above to see this type in use. First year the “Camp Tr.” legend was included. A plate for the front and back of the trailer?!? From 1943 through 1955 the date was indicated by a corner tab. Late variant of this style plate. Note the “CONN” doesn’t have a period, and is shifted to the right. This plate is made of aluminum. This plate is made of steel. These plates were used for 2 years. Most of these plates were made of aluminum, as this one is. A very few plates of this style were made of steel, similar to Dealer and Repair plates. This plate is a steel variant.